Taking the Lovecraft theme that is one of the most frequently used in board games, Fantasy Flight Games managed to create something new and special – a co-op game of many subsystems that come together almost flawlessly to create engaging, coherent and suspenseful stories time after time after time. Put on your fedora hat and collect your occult research. We are going to save the world or have a blast trying in Eldritch Horror. The game, gorgeously realized like all Fantasy Flight productions, takes place on a large world map with a couple dozen key locations connected by sea routes, railways and walking trails. One to eight players play the roles of investigators, attempting to stop a nefarious Great Old One – a terrible being of unimaginable power – from awakening / entering the world and wreaking havoc on our planet. Every turn players get to travel around the world collecting information and clues. Each player turn culminates in an encounter – a short scenario that takes place depending on player’s location. If you are in Istanbul – one of the several pre-determined Istanbul-specific encounters will take place. During these, players are often required to use their RPG-like attributes (Lore, Strength, Willpower and the like) to pass tests determining their success or failure. The tests use dice, introducing a large amount of luck dependency. Once players finish their actions, certain game effects take place, introducing new obstacles like spawning monsters, bringing the Great Old One closer to awakening and so on. Players have a flexible but limited amount of turns to complete a set of three specific objectives (unique for each of the four Old Ones included in the base game). Completing objectives before time runs out wins the game. If the Great Old One awakens – the game goes into “final boss” mode, where players have a few last chances to win in very difficult circumstances. If these final attempts do not succeed – the players are defeated and the world is devoured. Eldritch Horror is a medium game in terms of complexity. There are quite a bit of options available to players, however most of these adhere closely to common sense and do not require memorizing arcane rituals (leave that to your characters!). A fair bit of attention is required to make sure you activate all the necessary effects during the appropriate phases of the game, but the effects themselves are streamlined and do not suffer from labyrinthine interconnections. There is a lot happening and it all feels right. The twelve characters that come with the game are all interesting and unique, spotting a decent mix of gender/race representation. Characters are highly customizable – you can improve their abilities through in-game learning (a welcome RPG element), outfit them with allies and weapons and teach them powerful spells with unpredictable side effects. Finally, characters can take on a variety of mostly negative conditions that add a ton of flavour to exactly how disfigured/insane the struggle has left your hero. While complexity is medium, Eldritch Horror is by no means a short game. With several players, it takes up to 3-4 hours. While these hours are well spent, the time investment might be off-putting to some. Solo plays can be breezy clocking in at 1-1.5 hours for experienced gamers. The game is extremely generous listing maximum amount of players at eight. In my experience, anything more than 5 leads to complete player disengagement due to down time. While there can be a lot of player interaction through joint discussion and planning – the character interaction is minimal as most characters will be going off on individual adventures and the game has precious few mechanics that reward in-game teamwork. This is one game where splitting the party is perfectly acceptable. It is also worth pointing out that a certain understanding of the game is required to enjoy it. First games might be somewhat frustrating as new players are not yet able to meaningfully participate in discussions. The learning curve is not steep though and the story engrossing enough to not make it a chore. I have already listed several drawbacks of the game – it relies a lot on luck, it lacks character interaction, it can take a long time. In fact, you know what? Mechanically it is really not the best game out there. There are some balance issues too like disproportionate difficulty of some objectives. Ultimately, though, it does not matter. What Eldritch Horror delivers is something more than a game. It is a full-blown experience. The many game components click together like gears in a complex mechanism, whirring the entire thing to life. Now and again, the components interact to produce amazing, almost cinematic scenarios – an expedition leader who specializes in getting teams together gets paranoid and murders his companions; a flying monster carries an investigator halfway around the world – convenient transportation but the character’s sanity suffers. The descriptive text is very good throughout, plunging you deep into the Lovecraft mythos, setting a solid dark mood. You feel that the world is ending, that there is not enough time, that you fight against an overwhelming force and just might succeed if you are smart and lucky. Your characters become fleshed out and you always remember that time when you got locked up in prison when you crucially needed to be in Shanghai to close a gate. All the terrible things that happen to your characters – the injuries, the madness – is right there in the cards. The game tells a story. And it’s such a robust storytelling mechanism that the stories do not get stale time after time. That in my mind is its greatest achievement. When defeat is at hand, the Old One awakens and you understand just how dire the situation is and how unlikely your chances at success – the climax matches those of many films in intensity. It is too bad that victories mostly do not have the same payoff (rare as they are). Achieving all goals prior to the awakening of the big bad feels flat as opposed to the apocalyptic world-end encounters. I will acknowledge that the game is not for everyone. The reliance on dice will drive some euro fans mad as surely as staring into Cthulhu’s eyes. The initial learning might be challenging. Some balance issues are present. However, if you are in the mood for an engrossing experience that does not let go – try Eldritch Horror. The dark stories it will tell you will stay with you for a while. If you liked this review find more board game materials over at Altema Games website . I’m a newbie to the whole board gaming hobby, I’ve only started collecting (and playing) these modern board games this year. Coincidentally, I’ve only recently started reading Lovecraft’s fiction. Being the type of person that dives deep into a new interest, I bought Eldritch Horror after weeks lusting for it. I won’t delve into the mechanics as the other reviews have already put it into more detail than I ever could. I’ve had this game for a month and have only been able to play it three times due to limited opportunities to actually play. I’ve played it once as a 2-player and twice as 3-players cooperating against the Ancient One. The rules are actually fairly easy to learn – but the game is difficult. We haven’t won a yet and have our behinds handed to us when we thought we were doing fine. That’s what the game does well. At the start, you and your fellow investigators are all confident and optimistic. You’ll have a strategy in your head and amongst yourselves. However, the random challenges that the game throws at you can quickly throw a wrench in your plans. You’ll quickly feel the desperation as you and your fellows are scattered around the globe trying to rest but looking at the Mythos deck and what horrors it can spew at you. All three of our plays were exciting and there were some moments where we exclaimed happily at triumphs and really felt down when a character died. The game is intimidating (well, to a noob like me I guess) and the difficulty is quite high. But the game’s disregard for your (in-game) health is what makes me and my group keep coming back. We want to uncover more experiences, buy more assets/items so that we can rescue the world from Cthulhu (or whoever). I’ve already picked up the Unseen Forces expansions and me and my mates are already chomping at the bit to face our next deaths. Highly recommended to gamers who love theme and co-operation. I was hesitant at first to buy Eldritch Horror. I’d already spent a lot of money on Arkham Horror and it’s expansions, and I wasn’t sure if Eldritch would be sufficiently different to make it worth adding to my collection. A friend of mine got to play the game, however, and quickly sold me on it. Eldritch Horror has a similar premise to Arkham, in that an Ancient One is rising and the investigators are seeking to prevent it from awakening and bringing doom to the world. The investigators include familiar faces from the Arkham/Elder Sign line (disappointingly lacking is Harvey Walters – all the way back to 3rd edition Call of Cthulhu the RPG from Chaosium, Harvey has sort of beena staple in the Mythos games for me, and it feels strange not to see him; hopefully he will arrive in an EH expansion at some point). In this game, however, the investigators are coming from all over the globe, and their search for a way to block the impending Horror also take them all over the world. While Arkham dealt with Mythos occurrences and threats within “Lovecraft Country”, and Elder Sign takes place inside a Museum, Eldritch Horror has the investigators traversing the world searching for clues and unearthing ancient mysteries. Ancient One Specific Storyline: Each of the Ancient Ones has its own deck of Mysteries (which are solved to prevent the awakening of the Ancient One) and encounter cards (which the investigators must take on to obtain clues), so the game has encounters and story elements specific to each Ancient One. This gives the game a more ‘dedicated’ feel than Arkham, where all manner of Lovecraftian occurences are taking place. The Mythos deck is also different in each game – the deck consists of three colors of card, and three tiers. The Ancient One determines how many cards of each color are shuffled into each tier, so you never know what the deck will contain each game. Global Adventures: The investigators get to explore exotic locales (some of these are specific, like Shanghai or the Himalayas, while others are generic city, wilderness and sea encounters), including undertaking Expeditions to specific places (there is one expedition in effect at any time, and the investigators can travel there to pursue the story in that locale if they wish). As with Arkham Horror, encounter cards are split into three possible encounters, determined by the location in which the card was drawn. The encounters are interesting and rich with flavor, for those who enjoy the story aspect of the encounters in games like this. Good Game Pace: Eldritch Horror seems to move at a good pace, with each investigator performing two actions and having an encounter each turn. Compared to Arkham Horror, I do find that this game plays out much faster (though to be fair, what tends to slow down my Arkham games is the expansion content). Eldritch Horror seems to move a lot more briskly along, in my experience. Omens of Doom and Mythos Events: I really liked the addition of the Omen Track, which has four positions displaying 3 icons. As the Omen Track advances due to certain Mythos Card events, it triggers various effects (the most common being each gate with an icon matching the current open adds one to the doom track). Another cool game mechanic I liked is the “triggered events” – when certain Mythos cards bearing a given symbol are drawn, various monsters, rumors and condition cards will activate. It makes for a very dynamic game, as you never know just what each round will bring. Ancient Ones: I don’t have a lot bad to say about Eldritch Horror, but the one thing that is a bit lacking is the selection of Ancient Ones. The basic game so far only has 4 Ancient Ones in it (Azathoth, Yog-Sothoth, Shub-Niggurath, and Cthulhu). While these are all really great, and I get that with the Mysteries and Ancient-specific content it takes a lot more cards and more work to create an Ancient One for Eldritch Horror, I hope they release expansion content that adds more Ancient Ones (Nyarlathotep, Hastur, and Ithaqua are all notably missing, and I think would be really interesting in the Eldritch Horror style of game – Nyarlathotep in particular could be approached in a number of ways, with his various Mask incarnations he could be an expansion unto himself if handled the right way). That being said, you can still get tons of fun and game play out of the four Ancients in the initial game. Overall: I found this game a welcome addition to my game shelf. It’s sufficiently different that it will not lure me away from Arkham or become redundant. The two games each have their own merits, and while they share that familiar Mythos feel with each other, they each offer their own distinct game experience. Ok, maybe it is too early to tell. But let me start with this – this game came many years after Arkham Horror and FFG have really outdone themselves this time. It is a mystery-solving adventure game set in H.P.Lovecraft’s Cthulhu mythos. You and your friends take the roles of ordinary 1920’s people and cooperate in a struggle to save the world from an unspeakable horror. The game offers easy to learn, fast-paced and fun gameplay, combined with engaging theme and interesting narrative. The rules are very streamlined and easy to teach and learn. The rulebook is helpful and clear. Though the game has hundreds of tokens, cards and tracks you move around all the time, everything is clear and well designed. Good job FFG! I won’t get into that because there’s nothing I can say about Lovecraft that hasen’t been said thousands of times. It’s the classic Lovcraftian horror world and the designers really payed attention to detail. This time around though, you’re not running through the streets of Arkham, Insmouth or exploring some hounted mansion. This time you travel throughout the entire world closing gates to terrible dimentions and fighting evil. The game is very emersive and Chtulhu fans will fight their favourite monsters, while people who are new to the mythos will focus on the interesting characters and do their best to save the whole planet. Lovecraft fan or not, you’ll have fun with this theme, I’m sure of it. Nothing revolutionary here, but all the mechanics work flawlessly, allowing the players to sink in the rich theme. You take control of one guy, buying train and ship tickets to travel the world, equipping items, learning spells and fighting evil. There’s a wonderful Omen system – you keep track of the constellations. When the stars are right bad things happen in certain spots on the map. It is very thematic and works beautifully. From start to finish the game flows and the situation changes all the time. The game is slower with more players and faster with fewer. Either way, fun is had by all. This is where I think FFG really, really outdid themselves. The art is gorgeous! The characters and monsters are drawin in top notch realistic style, while the board is clear and everything has it’s place. The iconography is vivid and clear, the tokens are amazing and everything is just beautifull to look at. I really value the art and graphic design in board games and this one is one of the best I’ve seen yet! I’m sure that this game won’t kill Arkham Horror. After all, Arkham is one of the legendary board games that everybody has and loves. However, this game fixes a lot of the issues of it’s predecessor, offering simplified rules, better art and faster (and more fun?) gameplay. The basic game offers fewer characters and monsters to fight, but we know FFG – they’ll spawn expansion after expansion until you get every single monster in the Mythos plus probably more! Maybe soon enough the stars will align for this game and Arkham Horror will fall in deep slumber, while Eldritch Horror takes it’s place in our shelves and becomes the definitive “Horror”. But we shall have to wait and see. This game was NOT on my list of games I wanted to try. Any adventure, RPG,D&Dish, dice determining games just did not appeal to me. The only reason I picked up this game is it had some great reveiws, was Co-op ( I enjoy pandemic), and my wife looked at it and said THIS LOOKS KINDA OF FUN, WANT TO PLAY? I will try any game I can get my wife to play, she is not a heavy gamer but is slowly transforming. So we bought it and wow I was surprised how much I love this game. 1: Co-op games are fun and this does not disappoint. 2: Theme can be felt and looks great. 3: Good amount of options, decisions feel impactful but not always devastating. 4: Love games with roles and different role abilites. 5: Lots of diversity between cards, roles, and Ancient ones. Re-playable. 6: Game is a good challenge and keeps us on the edge of our seats. 7: My wife LOVES it. What a bonus. We can play just the 2 of us and she has a blast. 9. Did I mention its fun? I really feel like 2-3 hours flew by. 10. You can DIE. and come back as a different investigator. One game I died intentionally and it worked for us! 1: Some mechanics are irrelevant without specific mythos or ancient ones. Not many. 2: I stated above the game is very replayable but I believe without the expansion (which I haven’t played yet) the game WILL (it hasn’t yet) seem Da Ja Vuish as each Ancient One has 4 mysteries and you solve 3. The expansion which adds another ancient and 2 new mysteries for previous ancients seems to be a great solution to this. 3. I do not think this game is hard to learn, BUT it was hard to teach myself since we did not know anyone who played. 4. If you teach yourself you will likely play the first few games incorrectly. I have not played the expansions but I am much for interested in the ones that add variety to the base game instead of adding a separate mechanic on a separate board. TIPS: Your win by solving mysteries. Don’t get caught up killing monster and closing gates. It is important and will sometimes keep you from losing but not always necessary. …Of clichés I’m going to unleash upon you. I try to keep it limited as possible, but can’t promise anything. Let’s see if FFG has managed to streamline the legendary Arkham Horror without doing so on expense of the tension it predecessor gave. I usually like to make quick summary on how the game plays, but for this it will be a though one. It is not as uncomprehending as Arkham Horror, on which memorizing the rulebook, you could join in insanity with cultists of Azathoth. Thus I try to bring up things on which Eldritch succeed on comparison of Arkham. Game map covers the whole world, which gives great feeling that it’s not just some local anomaly, but involves the whole human population. Monsters are spawned on gates, but some of them have pre-set locations where they go automatically and they don’t have complicated movement rules to remember. There is no need to collect Elder Signs anymore and closing gates are easier, but in no way too easy. Some players find this one to be disappointing, but I feel it doesn’t sacrifice on difficulty of the game. Assets (equipments) can be acquired from every city and there is no longer need for one player to camp on Curiosity shop to dig better stuff or equipment. Money is gone and method of replacement is dice roll test with influence skill, good replacement and makes acquiring items though. Reckoning effect that inhabits some cards and monsters give it own feel of impending doom. Omen track gives you a chance to prepare for movement of doom track and is easy to read and keep up with. Does it feel like it has lost some of Arkhams tension and claustrophobic feeling? Certainly. Is it easier and faster to get in? Most definitely. On positive side story feels more coherent and bound together compared to Arkhams random encounters. The subtopic of this part is more true than it begs to be. There is a lot of cards, pieces and tokens, which you can’t help but drop few of them to floor during gameplay. All which are high quality and filled with magnificent illustration, truly a beauty, as to be expected from FFG. Encounter cards are divided in three segments to reduce amount of decks needed, even though they’re very light decks by themselves and would have deserved additional cards each. Condition and spell cards have two side, first the explanation side and then the effect side, which is really great touch since no two cards are identical. This keeps you weighing on the possible downsides of the cards before activating them. This game has quite an amount of rules and small intricate details. Keeping tabs on them on first few games will be difficult, especially if there is only one who knows the rules completely. I would suggest getting cheat sheet from BGG or make ones yourself to ease up gameplay. Rules are still by far more clearer and straightforward than Arkhams and it won’t be impossible task to play a game through without making mistakes along the way. Besides main point of the game is to enjoy horror story of Lovecraftian proportions, few mistakes here and there won’t kill the game, especially since it’s usually not in your favor. Game comes with a rulebook and reference book, which are made in kinda weird way, since you need to read both of them to understand all the rules. You can go through rulebook and think “OK, this ain’t too bad, it’s quite clear”, but when you look at reference book you realize there is a lot of things not even mentioned in rulebook. So read both of them before playing. I feel that Eldritch Horror does stand as great replacement for Arkham Horror for those who want to play more than one game in one evening and is bit easier to grasp than learning completely new language. However it still stands apart well enough from Arkham not to replace it completely. Sure it’s lighter and easier to get on, but it doesn’t quite have the same desperate feeling on it. In Arkham you can feel walls closing on you. In Eldritch you have more space to roam since the monsters don’t move and you can arm yourself for encounters with them easier than in Arkham, thus not having such and looming feel of urgency upon you. This however easily lulls you in false sense of security and then it’s too late to do anything for it. This game is great fun if you have a right kind of gaming group. Not everyone will like this and some will find this too heavy for them. With proper music playlist (lots of them in youtube) and people who are into story based games this is definite pick. Confession time folks. I have not played Arkham Horror, Fantasy Flights sprawling ode to H P Lovecraft and his twisted tales of doomed lost souls. I came close quite a few times and its sat in my Amazon wishlist for as long as it takes to play a game of Twilight Imperium 3, but I never quite convinced myself to push that button. There is a couple of reasons for this, the innumerable amounts of expansions for the game being the biggest, I’m not saying expansions are a bad thing, just the opposite and in fact we will touch on the subject later in this review, but looking at the sheer amount of extra stuff for the game my wallet gave a little cry. Even the base gave is a table hog (I’m looking you Firefly as well) and then I wasn’t entirely convinced my group would embrace it, Arkham does look a daunting task at first glance. 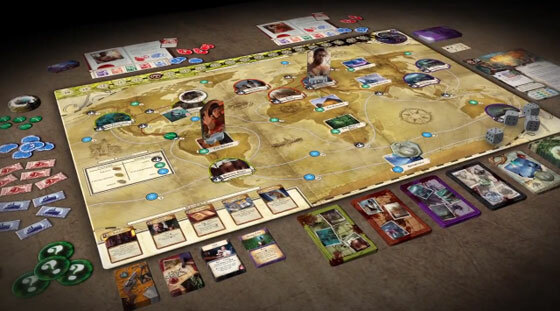 But luckily for me FFG solved my quandary by announcing Eldritch Horror, which looked to be and is for all intents an Arkham Horror reboot, a great place to leap in at the ground floor. Eldritch like Arkham is loosely based on the works of HP Lovecraft, it has cherry picked from his multitudes of elder gods and horrid things crawling at the edges of our sanity and wrestled them into a big box of dark intent. Set during the 1900′s this game see’s you take the role of one of 12 plucky but ultimately doomed adventurers, you are tasked with the unenviable job of travelling the globe desperately trying to shut down portals that are tearing through the fabric of our reality and spewing fourth icky orrible beasties. All the while the big bad Cthulu or another of his type is waiting in the cross dimensional wings to bring about the end of the world. So no pressure then. Eldritch is at its most basic a great big horror story in a box, it will chart the short and terrifying journey of your character and their inevitable death at the tentacles of some nameless horror, recounting an evening of Eldritch will probably gain you a space on a packed train and some funny looks. As with all FFG titles this comes with a heap of quality components and tokens, and cards and more tokens. In this set there are four separate ancient ones each coming with their own tailored decks, so whatever bad guy you pick there are cards in here to add a nice thematic touch to proceedings rather then a ton of generic story fillers. The actual game is pretty straightforward helped hugely by a very well put together rule book with an additional reference manual to help with some the games trickier bits. I doth my cap to FFG for their efforts here and all you other publishers out there need to take a look at this thing because they get it right. The game comes with a lovely big board that portrays a world map of sorts with all the various locations and routes scattered around it, the iconography is simple and everything is very easy to understand, there is also a neat little key on the board should you be confused as to what you are looking at. Its not that busy and if anything is a little sparse. A game turn plays out over three separate phases. First comes the investigators action phase, you get two actions to perform and they can be travelling to some far flung location, have a bit of a rest (regaining health and sanity). If you are in a city yo can do a spot of shopping or book some tickets for a trip which will allow you to make one additional move dependent on what type of transport you selected and eventually some equipment and spells include actions that can be perform as well. Once all that has been resolved then you move onto the Encounter Phase. So you’ve trekked across the globe to Antarctica maybe to uncover an expedition, or follow up on a clue. Scattered across the map are main locations that pull from color coded decks of cards and dependent on your location you read the flavor text that will set the scene and then will resolve a skill check against your investigator to see how well they did, some of these are pass or fails others will add more lore and options. You might also have to battle it out with a monster if you find one lurking on that spot. And finally comes the Mythos Phase where something unpleasant will occur, in the early stages of the game when there are fewer gates on the map and monsters or conditions these can be less horrific. But as time proceeds these very quickly start to ramp up the problems. And this is the thing, the start of this game is deceptively serene with a scattering of options on the board and it is easy for you to fall into a false sense of security and muddle about engrossed in solving some simple city encounters or other nonsense. What the game does is slowly creep up on you when all of a sudden you feel those icy tentacles on the nape of your neck and everything turns to poop, suddenly you are spread across the globe facing off against vampires, ghouls and elder beings barely keeping them in check whilst more gates are popping into existence spewing hoards of dribbling nameless horrors onto the board. At its heart Eldritch wants to tell a story, unfortunately none of these will have a happy ending, but the ride is a hoot. As each character slowly tells their tale of discovering long lost texts in ancient libraries or duking it out with a mummy at the pyramids, even if at the end of the night the earth is going to die screaming and take you with it. Its the most fun you can have during a apocalypse. This game is all about the options, and its constantly throwing up more at you, like a child that’s eaten far too many skittles you are mopping up each fresh multicolored torrent of horror only for a fresh wave to scatter across the board on its heels. it is a little unbalanced going from very little to accomplish to suddenly too much, but at least its not dull. There are plenty of other neat touches like the various conditions and magic that crops up along the way. Want that shiny spell book from the store but don’t have the coin right now. Well you can take a debt, but the problem is you don’t know who’s picking up the marker and what the repercussions will be down the line or when they are going to be an issue. You see the spells and various conditions all come with two sides, so whilst that teleport spell you have would be really handy this turn to get your buddy across to the location of a new gate, you know you are going to be flipping that card when you do and the results are rarely ever good news. That’s this game through and through its like some schizophrenic abusive parent constantly offering some shiny new trinket in one hand whilst clutching a roll of quarters in its fist to pound you in the next, its always with trepidation you reach for that new bauble because you know that slap is never going to be far behind it. This is a co-op game with many of the separate characters having skills and actions that come into effect if supporting a compatriot in some foolish endeavor, its all about balancing who you take along for this **** ride. You can happily run about in your own little solo adventure but you won’t get very far. And whilst it could fall foul of the dreaded alpha gamer, there is so much randomness to proceedings I think it will even pummel the most vocal into submission eventually. Whilst there is a lot in this box I have some niggles, it does feel a little light in places the exploration decks especially the city ones are small with only 8 cards in each, and whilst I never managed to cycle through a whole deck of one color it did come close and you play this enough and you are going to see the same cards coming up again and again. Obviously we are getting an expansion this is Fantasy Flight and i’m sure they have a few already waiting in the wings, here’s hoping that they focus at least one on beefing up all the decks available. The Mythos decks and especially the tailored ancient ones cards are a great addition and including a new set of unholy terrors with more items and location cards would be a win in my book. And dice, why only four bloody dice it should have had at least double that, fortunately I have more but still. And as we’re discussing items these are also a tad random, I understand the need for the mechanic but it is a mechanic what does seem to pull you out of the game, with such a limited amount of purchasable equipment at a time considering you are travelling the globe it seems strange that there are only ever four items available to buy. But this is all nitty gritty, there are no horrible game killing mechanics and as a start off point this is a solid place to begin, I’m quite interested to see what they have up their sleeve for this series. I just hope they don’t fall into the trap that the Arkham expansions appeared to by bloating the base game with rules and boards without adding any real new experiences. Please keep it lean. If like me you have yet to dip your toe into Fantasy Flights Cthulhu games then this is a great place to start, you get a solid game with enough choice and variety to tide you over until the expansions start to arrive. And its a pretty zippy play time I’d imagine a 3-4 player game should be doable in under two and a half hours with some change. So dim the lights and gather your friends and prepare to jump on, this is an express elevator to ****, and its going down. Most Cthulhu games are a 6+ hour affair outside of Elder Sign. With seven people the game took about 4-5 hours to play out. Its a much needed speed up from Arkham Horror. With the combination of Eldritch Horror and Elder Sign my other Cthulhu games are pretty much going to be shelved for a while. The test will be if future expansions don’t ruin what has been built as a very strong base here. -The game oozes theme and you feel it playing through. -Rules are easy to pick up and understand. -Since its from FFG, definately getting expansions. -Lots of card and tokens. -Bad insert (seems to be a standard FFG deal) so get rid of it and use some kind of organizer in it. -Avoid playing with the gamer(s) who are too Alpha, don’t pay attention to what other people are doing, needs constant reminding of what they can do. Arkham Horror as a concept and theme has long intrigued me but the scope and scale of the game is daunting. I’ve held the game in my hands, turned it over, felt its heft, then wondered if set-up and play time would leave it a dust-collector. Along came Eldritch Horror. The semi-Lovecraft, quasi-Gothic horror I wanted in a manageable game. EH has plenty of depth, a diverse cast of characters with strengths and weaknesses, offers an in-depth solo experience, and scratches the Akrham Horror itch (I guess – I’m presuming here). A tip: manage the game! Keep monsters and their spawning gates to a minimum. You can get overwhelmed very quickly. I enjoy cooperative games that are difficult to beat and that tell a compelling story along the way. This game has these qualities in spades! – Turns are divided two parts: 1) everyone moves, then 2) everyone searches/fights. This reduces wait time between turns. – The rules are somewhat complicated, but not terribly so, however if you don’t play it very often, then you’ll spend extra time reacquainting yourself with the rules when you start playing the next time. In my opinion, there isn’t a more challenging and epic game out there. If you enjoy horror games, horror movies, or horror stories, then this should interest you. If you can find willing players with similar tastes to your own–or if you enjoy a solo challenge–then you owe it to yourself to give this one a try. Eldritch Horror – A game of strategy and co-operation that is guaranteed to kill you most of the time. I would like to start this off by mentioning that I am a big fan of the Lovecraft mythos, but have been put off from playing the major mythos game ‘Arkham Horror’ by the sheer size of that game. Therefore I was pleased to see Eldritch Horror at my local game store, as it seemed to be a more compact game to play. I was not disappointed. One thing to point out is that with the full compliment of people the game can take a very long time; with 4 people the game should take roughly 3 to 4 hours, more than 4 needs to have a devoted afternoon. Therefore if you are going for a quick game, this is not for you. Conclusion: I strongly recommend this game, however I suggest you avoid it if all you like are quick competitive games. A must have for the disciples of Cthulu! It’s streamlined and well constructed. There is little chance of seeing the same cards two games in a row. That being said, you may require some of the expansion sets if this game gets a lot of table time, as facing the same Elder One may become slightly predictable. This is a co-op game. This means that there needs to be good communication and coordination amongst the players. The game allows a player to go out on their own and horde artifacts and spells while leaving the others to their fate. Not only will this draw the ire of other players, but also the wraith of the Elder One. This is one of my most favourite board game of all time. If you’ve never played any of the other Arkham, H.P Lovecraft themed games by FFG and you want one heck of a challenge you’ll talk about afterwards, this is the game for you. If you’re an Arkham or Elder Sign veteran, you may appreciate the streamlining and attention to detail that FFG put into this game. I’m a fan of many Lovecraft mythos games – Arkham Horror,Call of Chulthu, Witches of Salem, Mansions of Madness, etc.. But, one major problem with many of these is that they are insanely long to play; requiring 6-8 hours of inflicting dark suffering onto your gaming partners. Folks just don’t want to spend that amount of time on a co-op game and I rarely get a chance to pull these out. Eldritch horror condenses the play-time and expands the chaos to cover the world. We were able to finish a first play in 2 hours of theme-packed adventure. EH also addresses the randomness of Arkham by a new system of lingering effects and progressive mysteries and actions. The mythos deck is also constructed in three progressive phases that draw on more difficult card combinations as players progress. This replaces Arkham for me as it carries all the theme is a more condensed playtime. Now, I can spend my few epic scale board game plays on pulling out TI3 or something else instead. And I can get my horror gaming in to a regular game group event. This game is very much a situation where you will get from it, what you put into it. It does feature a lot of rules, a ton of components and a box that will cry out for an organizer. On top of that it is highly challenging at times, but let’s take a closer look. Taking place in Fantasy Flight’s Arkham Horror series, this game is the follow-up to the popular Arkham Horror. Having said that, this game is a beast all it’s own. It is streamlined from Arkham Horror, featuring far fewer rules, but still having the familiar theme of working together with other investigators, in an effort to prevent the Ancient Ones from rising up and destroying mankind. Players take turns moving around the globe, acquiring weapons, spells and allies to help them in their tasks. Ever present is the doom counter, which will tend to move on nearly every turn and if it gets to one, the Ancient One awakens and you are really in for a world of hurt. I enjoyed this for its cooperative nature, coupled with an often sadistic opponent in the form of the game mechanics. Every round you have a mythos phase, where you sometimes get more enemies, a rumor that can cause you to lose the game if not addressed, not to mention events that can cause you to become injured or lose some of your sanity points. Unlike Arkham Horror, when you lose all of your sanity or health, you are essentially done and forced to draw a new character in order to continue. I could go on, but take a look at the game on youtube and see if it suits you. The games can run from 2-5 hours, depending on the experience and number of players. I must warn that the game has some seriously hard Ancient Ones, a level of randomness that can undo the best players and additionally a total of 7 expansions that each add new characters, Ancient ones, enemies and often new play mechanics that can make the game more interesting. This is currently my favorite cooperative game and we try to play this at least once a month. It can be played solo, although make sure you use at least two investigators. Bear in mind that random numbers of players often makes it more challenging for reasons I have not yet figured out. There is a wonderful online community out there that is very passionate about this game, do not hesitate to reach out and use them as needed! This is the first game I have bought out of the Arkham terror franchise and it’s awesome! It looks complicated to begin with but after one game you won’t need the rule book to hand, and if you do hit a snag the inclusion of a shorter reference book makes it easy to overcome any difficulties or disputes. This a true co-operative challenge, I have only managed to defeat one old god in about 10 games haha. But even losing isn’t too bad because everything that happens is unpredictable and the theme, illustrations, and story are captivating. I have played with 2-4 people and the game is just as hard with any amount, as the difficulty increases with the players, and more monsters show up and more bad stuff happens… Which is pretty much all that happens, very rarely you’ll turn over a card that does you some good. The game is long but not as long as some people seem to claim, I’ve not played for more than two hours since the first game, if everyone’s familia with the game the world 9 times out of 10 can be over quite quickly! All the characters are completely individual and good at different things, it’s important to pick a team that has a broad range of skills, if you have no one who can fight your doomed just as if you don’t have anyone clued up in lore. Pick your team of investigators from all over the world and fight ungodly demons and travel nightmarish realms in search of clues to save the earth, and probably fail, but you will try again and again that is a promise. Arkham Horror is one of my all time favorite games, period. I love it and would play it everyday if I could. The problem is I can not always find people who agree with me, especially when it comes to the time allotted factor. So Fantasy Flight designed a game that has most of the flavor, some neat differences and much quicker turn around. Eldritch Horror, first is based off the Cthulhu Mythos, one of the ancient ones is going to destroy the world and you need to find out how and stop it. Similar to Arkham some new features are you are searching on a global basis, and you are doing more investigating rather than just trying to seal up gates as the monsters try to break their way into the world. Each ancient one has their own special cards and scenarios which are a fun twist. Not as many ancient ones(only 4 to start) but the expansions do add to that. There is still a lot going on each turn, and the play feels similar, yet they streamlined the turns and what you can do. Everything is coded with symbols so it is easy to figure out what you are doing. All and all, it is a nice add on to your Cthulhu game fix, it doesn’t replace Arkham for me, but it lets me play it more often. I really enjoy playing this game. It is very engaging, especially if you like story driven games or like to immerse yourself in a role and get a bit dramatic when reading the cards. It’s a cooperative game, so it has to provide quite the challenge. I am a big fan of cooperative play, because I am also competitive. When I play against other people I will do anything I can to win, even if others get upset with my aggressive play. When I play Eldritch Horror, my competitiveness goes into helping the group beat the bloody game. In this case I expect the game to give me quite a challenge and Eldritch Horror delivers here very well. Wining is not that probable. I like the components. The graphics are really well done and the short story that is conveyed with encounter and condition cards is pleasing to read. There are a lot of cards and monsters. Here I’ll mention a small drawback. After playing a few games, especially once a week or so, the cards start to get kind of repetitive. This is solved if you buy the Forsaken Lore expansion, which I did. This offers more re-playability to the game by adding a lot of cards, especially by adding another Ancient One and more missions. I didn’t find the rules too hard, but there are quite a few and getting all of them right from the start is probably impossible. 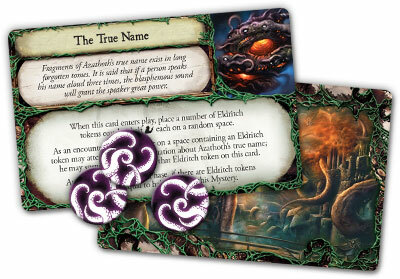 Compared to Arkham Horror, Eldritch Horror is simplified and more fluent in the events that occur throughout the game. 4 players is the ideal count to play the game. With 2 or less it’s not that captivating and with more than 6 it takes like 3-4 hours to complete. In conclusion, I really enjoy this game. It’s was highly engaging for me and the group with which I play. The feeling of dread is always upon you, especially when turning over the Mythos cards, making the time spent playing go by pretty fast. I recommend Eldritch Horror if you are a fan of Lovecraft’s works or if you like to get sucked into stories. I think we all know if you have played this game it is much better, I do not think it will replace Arkham as of yet, but as a whole this game is a much more streamlined version. The game plays much smoother and the game is near flawless. I think Fantsy Flight has really paid attention to the market. In fact after playing this a few times we brought Arkham Horror out to give it a play just some things seem clunky in the game. I don’t love it less it opened my eyes to a whole world of gamming and I owe it that. Arkham definitely has more choices of end game monsters and characters but at first play can be almost over whelming. Even though this is just as big it did not have that same feel and for that is much more repayable in the long run. Fighting minions and Great Old Ones from the Chtulhu’s mythos in a great adventure across the world is an interresting evolution for this line of games. The somewhat streamlined and simplified rules make for a quick set up and newcommers should be able to grasp the mechanics fairly quickly. The mythos is well presented but, by increasing the range of the adventure to the whole world, a certain disconnect appears between each explorer. Each investigator are still working towards the same common goal, but you loose a bit of that camadery feeling of an closely knit expert team going into a dire situation. It becomes less apparent that you are all part of a team, figthing to reach the same goal. By being less concentrated in one location (Arkham or even the Arkham Museum in the case of Elder Sign) you also lose a bit of that “paranoid / imprisoned in a very bad place” feeling of impending doom, even if the stakes are the same. The game is still great though, and maybe it is more a question of choosing between two different atmosphers (horribly isolated versus exilirating adventure) than picking which one is the better game. This is probably the most difficult game i have ever played. I’ve yet to actually finish it with out dying in the end. The games complexity and design is very rare and really impressive. I really enjoy the co-op playing and how much the different characters effects the game. All the different stories depending on the “boss” you chose or even the test or trials you chose to encounter during the game makes this a really dynamic and intriguing game, really awesome! The only bad thing about this game is the rule book, it takes some time to truly learn the game basic. It took about 3 campaigns until me and the people i play with fully picked up all the details and rules. I highly recommend you try this game! 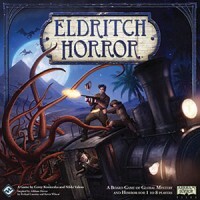 Add a Review for "Eldritch Horror"